Learn prime movers, end feels, and arthrokinematics for all upper extremity and lower extremity joint motions. Visualize precautions and tips for accurate measurement with clearly labelled images of incorrect and correct methods. Do you use a different way to measure? No problem! We have given you alternate methods as well. Sometimes it's good to know both! Check your knowledge with user-friendly quizzes that give immediate feedback. You can even choose specific joints on which to be tested. High-definition videos are available for each joint motion. Videos include visual demonstration and auditory instructions for patient position, goniometry technique, and patient communication. View primary and alternate methods with instructions for goniometry placement, norms, documentation, goal-writing. Relate joint motion to everyday activities through functional images and functional therapeutic goals. 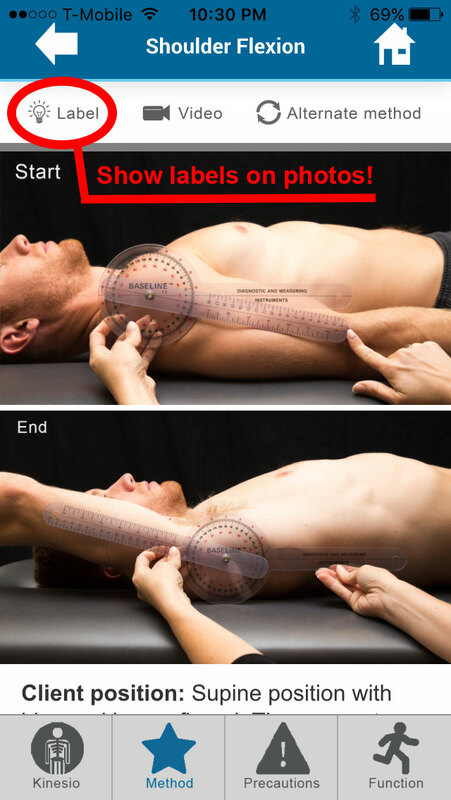 Easy to use labeled photos for every joint motion. Labels can be turned on or off so that images can be used like flashcards! GONI is a web-based application so it won't take up a lot of space on your phone. Plus, you get updates and added features automatically. Videos of goniometry measurements on real patients with impaired range of motion. Includes both upper and lower extremity deficits. More than just a textbook. Be smarter about the way you teach.